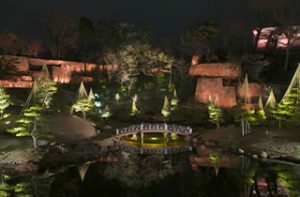 Kanazawa Castle Park and Gyokusen’inmaru Garden will open the garden at night every Friday · Saturday and the day before the holiday evening. This garden was cherrished by generations of Kaga Domain feudal lords and is now being displayed with a sunset-themed illumination.The two illumination displays last for seven　minutes in total. Runs on the night of Every Saturday and special service day.